Ade Williams, Pharmacist of the Year 2018 is the Clinical Lead at the multi-award winning Bedminster Pharmacy in Bristol. An independent prescriber with a General Practice role, he is also a qualified Canadian pharmacist. 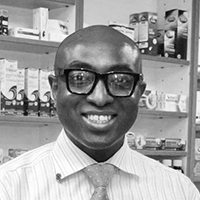 Ade and his team are widely acknowledged as advocates that champion and pioneer cost effective pharmacy-based community health solutions through their innovative interventions and collaborative partnerships framed around the Healthy Living Pharmacy ethos. Nominated for the NHS Person Centred Care Champion Parliamentary award, He is a Fellow of the Royal Pharmaceutical Society (RPS) for distinction in the practice of pharmacy, the inaugural winner of the RPS Patient Champion Award. In 2017, he received both the Community Pharmacist and the Pharmacy Manager of the Year awards.He features regularly across both the BBC and ITV media channels also supporting other media platforms. He is a part of the BBC Radio Bristol Morning Show presenting team and is the Pharmacy Ambassador for the Pancreatic Cancer Action Charity.